WE leave at 6.30am without breakfast, only hot water bottles and blankets. It doesn’t sound like we’re heading out on a wild South African adventure but this is how our safari begins. We’re all warm and cosy wrapped up in a Land Cruiser while our guide wearing shorts and a t-shirt turns and asks what we want to see. Lets go find some cats, we say. As the sun rises we bound off into Kruger National Park. Thousands of animals roam this wide space, an area roughly the size of Scotland. While the park is home to 147 species, the main draw is the Big Five – that’s lion, leopard, elephant, rhino and buffalo. Picking our way through the bush, it’s difficult to spot anything. There are rustles and strange sounds in the long grass but I can’t see any animals. The tracker perched on the bonnet with his rifle is much better. Despite being at risk of predators, he seems to notice the minutest movements in the distance – he’s an expert at finding shapes from hippos, a lone giraffe and zebras. Every now and again we stop to look at footprints and even fresh poop. It looks like elephants passed through overnight. The rangers can read what direction they took and even how long ago. Soon enough, we gasp and nudge each other as he sights a leopard through the trees. It’s hunting something that we can’t make out. Impressed to find it stalking prey, we sit watching in silence. We see another safari vehicle and they report there are elephants near the river so we decide to leave our first feline find to hunt alone. The ground is dry and cracked due to a two-year drought, which has left parts of the park looking scorched with dead trees and uprooted branches. It’s hard to see how anything could thrive in this landscape. Yet as we approach the river, it’s like we enter a different country. There are lush mahogany and marula fruit trees – an elephant’s favourite. And this is where we find a large herd. On the banks are thirty elephants including babies close to their mothers, young bulls jumping on each other and adult males spraying water. It’s like being backstage of a David Attenborough documentary – peeking into their secret lives off-camera. As our guide talks quietly about how elephants’ ears are the shape of the map of Africa, they begin to stroll towards us. The herd is making its way to the road- coming towards the vehicle. It’s an uncomfortable mixture of excitement and terror. As we look at them, they stare back. Some of us get nervous. We hold our breath, grit our teeth and fall silent, as they get closer. I am about to be nuzzled by the largest land animal on earth. I wish I had good rapport with nature. Instead I want to slide down the seat in front and hide under my blanket. I remember thinking what long eyelashes they have before turning to stone. Soon we are surrounded as they cross behind and in front. The elephants swing their trucks – which is how they smell. Some walk by munching on prickly branches. It’s the mother who stand’s guard. The guide tells us not to worry but we’re not convinced. He speaks in a calm voice to the elephants saying the baby is safe and they can pass. He better know what he’s doing, I pray. The ploy works and after 40minutes, the herd strides off at their own slow pace. When they are far away enough, we all breathe out. Now that was worth getting up for. We’re welcomed back to safety of Bush Lodge at Sabi Sabi Private Game Reserve just before 10am with warm face cloths and drinks. Being on a game drive can make you pretty hungry so I have a three-course feast – filling up at the buffet, ordering eggs Benedict and washing it down with a glass of bubbly and muffin to celebrate our once-in-a-lifetime experience. The lodge is a labour of love for managers Lauren and her husband Rod who take care of a cluster of 25 five-star suites with panoramas of the bush. Inside, it has an Out-of-Africa feel with its thatched roof, wooden tables and animal artefacts on the walls. It’s no wonder Prince Harry stayed here earlier this year. Everyone though is treated like royalty with guides escorting you back to your room each night. 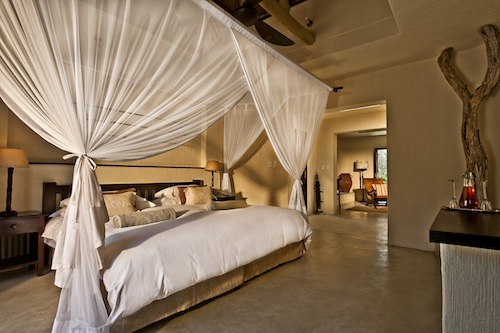 You couldn’t be closer to wildlife with baboons swinging from the furniture and impalas on the doorstep. The next morning the birds act as our wakeup call. We bounce along the plains spotting a skipping baby rhino with its mother. It wasn’t until the afternoon drive that we’d get to see all of the Big Five. As we head back to camp, word comes over the radio of a lion kill. We arrive in darkness to watch the mother ripping out a buffalo’s pink intestines. We’re so close we can hear the tearing as she gargles every last drop of glistening blood. With Sabi Sabi we don’t share our finds with other safari tours. As a private reserve, it has its own plot of the park, which if we duck our heads under the branches we can drive off road to follow animals. Visitors on a self-drive on Kruger’s public roads must stick to the tracks. And taking things up a notch further, dinner back at the lodge is served under the stars at a traditional boma with a barbecue serving roasted meats. Lit with lanterns and thick smouldering logs at the centre, guests toast marshmallows and share their stories over the fire. I tell a family about our elephant experience. You’re so brave, they say. I get a flash back and remember the dread. For more information about Mpumalanga, South Africa visit www.southafrica.net. A PAIR of chunky high heels, a khaki shirt, and a long black dress. I am on a roll in the United States of shopping. FROM the summit of the world’s longest Treetop Trail, I can hear the gentle rustle of leaves from inside the Bavarian Forest. I’VE done it. I’ve come back to Tenerife as a grown-up. I’m not in one of the 18 to 30s resorts - I’ve been there and done that.